We now rejoin our Project Solara toward the end of its time with us. Tearfully anticipating the day it leaves our care, we took the car to Performance Products in Van Nuys, California, where Orlando, the talented mechanic who helped us out with the brake rotors for our Project Mirage previously, tackled the front and rear rotor replacement on our Solara. For the actual rotors, we turned to Power Slot. The company provided us with front and rear rotors. They have loads of applications, so if you don't happen to drive a car like our Solara, give Power Slot a call, and chances are good that they'll have rotors to fit your ride. Now watch as Orlando gives the Solara a brand-new set of stoppers. Ah, yes. The ability to stop on the proverbial dime, all ready to whoa. Support the car on jackstands or a lift, if you happen to have one. Remove the front wheels and tires. You can remove the rear wheels and tires now if you want to, or you can wait until you’re ready to work on the rear brakes. The choice is yours. This photo is what your stock brake assembly should look like with the wheels and tires removed. Remove the two 17mm bolts from the back of the caliper. This is a rear view of the caliper and brake hub. Those arrows are pointing to the two bolts. Now remove the caliper from the rotor, and place it on top of the brake assembly so that you have both hands free to remove the rotor. An 8x25mm bolt should be inserted into the each of two holes on the rotor. As you screw the bolts into the rotor, the rotor will come off the hub. Take the shiny new rotor out of the box and slide it onto the hub. Remove the old brake pads from the caliper. Now there’s an empty space ready for you to install the new high-performance brake pads. Ours are Autospecialty Metal-Lux from Grand Auto Parts in El Segundo, California. Depending on the brand of your new brake pads, there may or may not be anti-seize included in the box with them. If anti-seize is not included, buy some. You’ll need it to squirt and smear onto the back of all the brake pads you install today. The anti-seize should be smeared evenly all over the back of each pad. It will help prevent squealing. Slide the new brake pads into place in the caliper with the anti-seize facing away from where the rotor will hit them. With the new brake pads securely in place, fit the caliper onto the new Power Slot rotor. Insert those two 17mm bolts back into their places through the back of the caliper. You may have to wiggle and adjust the caliper to get the bolts to go through. Here’s the finished product. Repeat the process for the other side so that both front rotors are properly installed. The caliper might seem loose at this point, but it will tighten up once you put the wheels back on. If you didn’t remove the rear wheels and tires when you did the fronts, do so now. The stock rear brake assembly should look like this. Just like with the front rotors, there are two bolts that you must remove to get the caliper off the rotor. However, unlike those on the front, these bolts are 14mm. Remove them now. Just like with the front rotors, slide the caliper off the hub and place it on top of the brake assembly so you can remove the stock rotor. Just like with the front rotors, grab the old stock rotor and slide it off the hub. Here’s something different (you thought we were going to say "Just like with the front rotors," didn’t you? Tricked ya!). Push the black rubber access plug out of the hole it sits in on the stock rotor. Hold onto it. Don’t throw it away. Push the rubber access plug into the corresponding hole on the new Power Slot rotor. Now position the rotor on the hub bolts so that the access plug lines up with the access hole on the brake assembly when you put the rotor on. Just like with the front rotors, put new anti-seized brake pads into position in the caliper, and then slide the caliper into place on the rotor. Insert the two 14mm bolts into the back of the caliper, wiggle, and tighten them down. There it is, your new rear brake rotor, courtesy Power Slot. If you’ve done the installation properly, like Orlando from Performance Products did for our Project Solara, then it should look like this. Repeat the whole process for the other side, and ta-da! You’re done. Please check this information against professional advice and service manuals for proper safety procedures and installation instructions. This is an intermediate level installation and basic knowledge of automotive repairs should be acquired before attempting. This was so well done, that i followed the instructions and did it myself. Such a feeling of satisfation and self worth was gained by me. roger182nd wrote: This was so well done, that i followed the instructions and did it myself. Such a feeling of satisfation and self worth was gained by me. Excellent! Glad it helped. Now let's see pictures of all your hard work! Ok well im actually about to do this myself but I have a complaint about one of the pictures. Yellow: They are used to remove the top half of the caliper not the whole assembly. 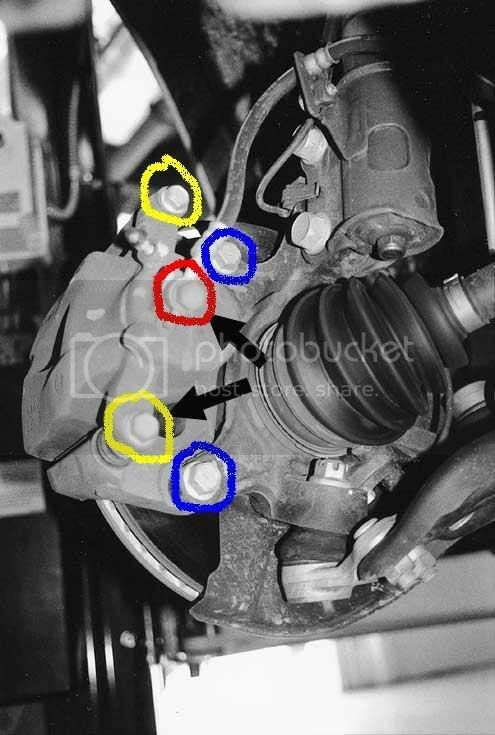 Blue: Is to remove the whole caliper assembly, so that the rotor can be removed. Im pretty sure this is right. Also, to remove those bolts in Blue what do you guys use? They are torqued like no other. I dont own a impact wrench. Slotted Rotors eat up brake pads faster rite? I believe slotted and or cross drilled eat away at brake pads quicker. ArizonaEagle07 wrote: I believe slotted and or cross drilled eat away at brake pads quicker. Slotted rotors will eat up the pad way faster than cross-drilled. Cross-drilled is only for looks. Actually, cross-drilled is for cooling purposes. An 8x25mm bolt should be inserted into the each of two holes on the rotor. As you screw the bolts into the rotor, the rotor will come off the hub. Has anyone removed their front rotors? Is the inserting of the 8x25mm bolt really necessary? Is there any other way to remove the rotors? Those are really talented mechanic. I can say it myself too. This brake rotors really give me a lot of headache since they are hard to figure out. I just get this new brake rotors. About to change my rotors this weekend. I know this is an old thread, but does anyone happen to have the pictures that went with the DIY? Really just want to confirm which bolts to remove. Also, is the 18mm bolt necessary to remove the original rotor? ?